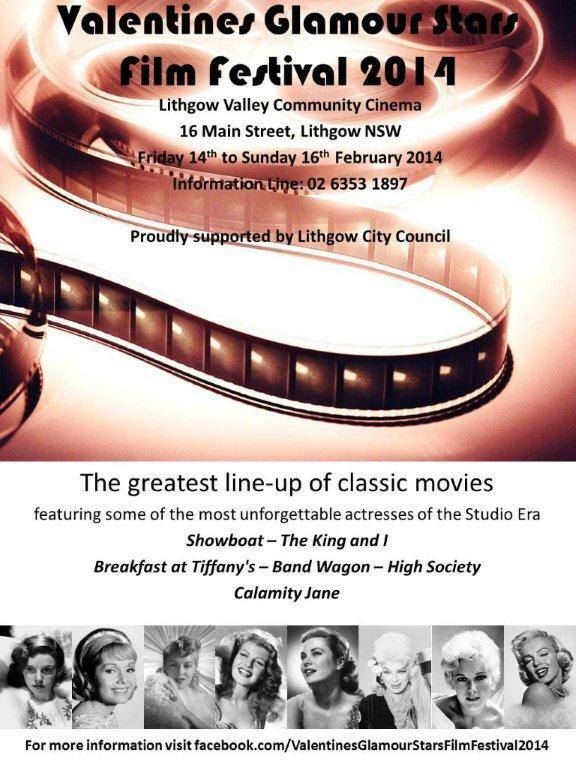 The Lithgow Valley Community Cinema part of the Lithgow Valley Film Society was formed in December 2002. It is a registered member of the Victorian Film Societies. The cinema primarily uses 16 mm and 35 mm film projection however recent screenings include digital projection. The society’s patron is Mr Andrew Pike. OAM. Following on from the success of last year’s film festival, the Lithgow Valley Community Cinema isproud to present the Valentines Glamour Stars Film Festival for 2014. The festival will be held over the weekend February 14, 15 and 16. Lithgow will be a hive of activity that weekend as there also be many events over that weekend as part of the Blue Mountains, Lithgow & Oberon Tourism’s Roaring 20s Festival. Bookings are now being taken for the film festival. Subscriptions for current members is $10 per movie.Subscriptions for non-members is $12 per movie which includes a three month membership to the Lithgow Community Cinema. Mr Adams, the Film Society co-ordinator, said in an interview with the Lithgow Mercury in March 2012, that since 2002 the society has become an important part of the social scene in Lithgow — ‘a town without a commercial cinema’. Persons wanting more information on the cinema can contact the co-ordinator on 6353 1897. This voluntary non-profit community cinema screens movies from Classics to new releases on the 1st and 3rd Fridays at 10.30am; 1st and 3rd Saturdays at 7.30pm. Some Sunday sessions at 1.30pm. Subscription includes morning/afternoon tea or supper. New & recent releases 1st weekend of the month, classic movies 3rd weekend on the month.